The Department of Homeland Security (DHS) has advised that it is on track to issue a Notice of Proposed Rulemaking (NPRM) by the end of the year that would rescind the rule permitting employment authorization for certain H-4 spouses. This timeline was announced in a court filing last month by DHS in the ongoing litigation around the H-4 employment authorization regulations. H-4 non-immigrants are the spouses and children of non-immigrants in H-1B status. For most H-4 non-immigrants, employment authorization is not available. In 2015, DHS published a rule permitting employment authorization documents (EADs) for a limited number of H-4 non-immigrants. In order to be eligible for the H-4 EAD, an H-4 non-immigrant must have a spouse in H-1B status who is the beneficiary of an approved petition for permanent residency in the United States but who is not yet eligible to apply residency due to the backlog in certain visa categories. This rule provides those non-immigrants who have already completed the steps for permanent residency in the United States, but who are stuck in a long visa backlog, work authorization in the United States while waiting for their permanent residency visa to be available. For workers from India and China, this line can be five to ten years or more. Since the rule’s promulgation in 2015, it has been the subject of litigation. The plaintiff, an organization titled “Save Jobs USA,” has claimed that DHS lacks the authority to grant work authorization to H-4 non-immigrants, and that permitting H-4 non-immigrants hurts American workers. The lawsuit was dismissed in September 2016 by the DC Federal District Court, which found that the plaintiffs had not shown that they were harmed by the rule and therefore lacked standing to sue. The case remains on appeal at this time. 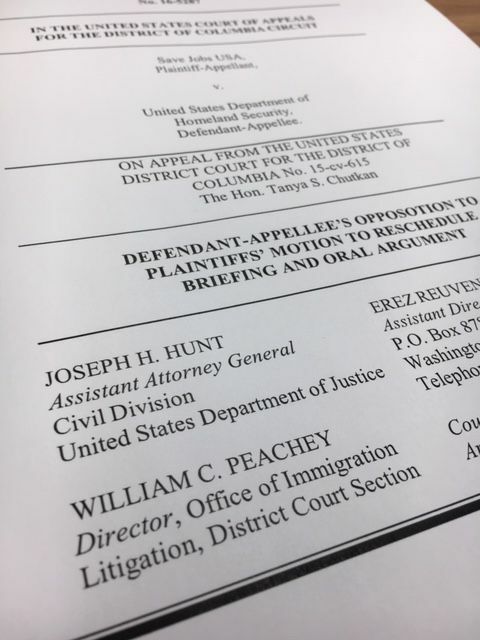 The Department of Homeland Security, under the Trump administration, has stated that it intends to amend and remove the H-4 EAD rule, and has argued that the issue will therefore soon be moot and the case should not proceed. In February of this year, the appeals court agreed to hold the case in abeyance to provide the government time to proceed with its rulemaking process. Since that time, DHS has file ongoing status updates with the court, continuing to assert that it is making progress on rescinding the H-4 EAD rule. This latest court filing provided DHS’s most concrete timeline yet – that the NPRM, with DHS’ new proposed rule will be published publicly by the end of the year.